To fill that time on the train rides I started writing about my trips. Back then I think I may have even had to do a search to understand what “blogging” even was. I could not have predicted how much impact that somewhat impulsive decision to work so far from home would have on the course of my life. But life did what life does, and there was a long meandering path. Along that path I continued to commute – sometimes more, sometimes less. I went through 4 different jobs until landing at my current job. Along the way I also changed residence and lived in the city of San Francisco. No more trains. I started a bike shop, closed said bike shop, and went back to the day job. My cycling life was equally as eventful. I caught the bug on that Fuji Absolute DX commuter, but quickly found myself a “proper” road bike. I started riding longer and longer distances. I became a cycling nut through and through. I rode the Tour de Cure charity ride (now known as the Gold Country Tour for a Cure.) And finally what is still my favorite cycling event – the Seattle to Portland cycling classic. After moving to San Francisco I traded my long rides for short, punchy sprints across the crowded urban landscape. I learned how to feel confident around traffic, how to avoid commuter train tracks in the middle of the road, and dipped my foot into the cycling advocacy world. For one of those years I had what may be one of the most beautiful daily commutes on bike I will ever have. I traced the shoreline of the city along the bay almost completely from south to north. The flat lands of Sacramento were a distant memory in the shadow of the San Francisco hills. I even rode the damned Wiggle. Those journeys are evident here on JustAnotherCyclist as well. 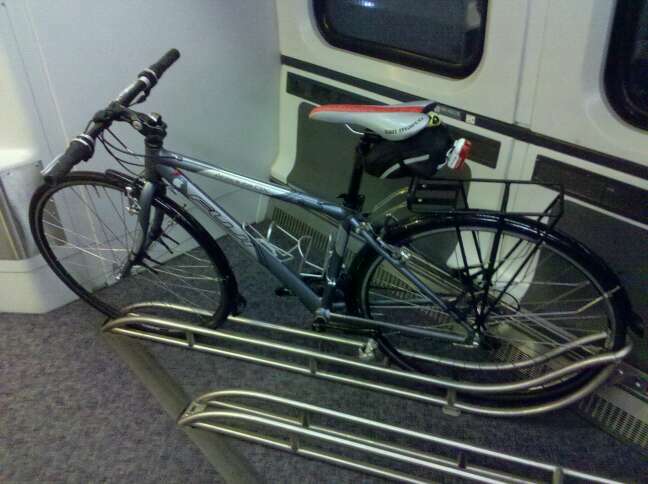 What started out has a blog about commuting became a full fledged cycling blog. The more I rode, the more I had things to write about. The more I wrote about cycling, the more I wanted to get out there on the bike and experience more things to write about. And here we find ourselves today with a moment of reflection. There have been several of those moments for me here on JustAnotherCyclist before. Today, however, is clearly one of those circle of life kind of things. My fiance and I recently moved out of San Francisco and back to… Sacramento. After a very long silence here on JustAnotherCyclist, I again find myself posting from an Amtrak Capitol Corridor train. I travel from Sacramento to San Francisco only one day a week now, but it is just the same as it was back then. Life has steered me away from the cycling world a bit in the last 6 months to a year, and it feels good to be coming back. Now…. just gotta get that damned creek out of the BB30 on my Cannondale and remind myself how much joy I can get out of riding more than 10 or 15 miles at a time.